In 2013, the energy industry suffered one of its worst ever terrorist attacks. An Algerian-based facility, jointly run by two oil and gas powerhouses and the Algerian state oil company Sonatrach, was attacked by jihadist fighters. In this article, we assess the mistakes that led to and exacerbated the crisis, and suggest how alternative effective site auditing and counter-terrorism (CT) policies could have averted or minimised the loss of life. Early on 16th January 2013, gunfire erupted in the pre-dawn darkness as two buses left a secure housing compound at the Tigantourine gas facility in eastern Algeria. The attackers, linked to a number of regional jihadist groups, including al-Mourabitoun, killed two individuals. The convoy scattered; one bus heading towards the gas facility, the other reversing back into the presumed safety of the housing compound. These repercussions were not limited to the loss of life. Operations at the plant, which accounted for approximately 11.5 per cent of Algeria’s total natural gas output, did not resume full capacity for over three years. Given that plant revenue is around four billion dollars per annum, this puts the financial cost from lost revenue alone at over 12 billion dollars. Meanwhile, the attack led to high-profile investigations, including in the UK. Nicholas Hilliard QC, the coroner responsible for the inquest, specifically criticised the facility’s security environment. Survivors and families of victims have launched legal actions against the companies involved, and the incident attracted substantial and sustained media attention. The consequences of not considering CT in risk management plans are not limited to the immediate loss of life or damage to property. Companies which fail to implement proportionate CT procedures expose themselves to operational, legal and reputational risk. A full analysis of the failures that led to the In Amenas crisis is beyond the scope of this document. Instead, we have focused on one specific area; the lack of preparedness for an attack of this complexity and scale by facility management. Detailed analysis of the threat level, combined with a specialist site audit focusing on the risk from terrorism, would not have stopped the attack. However, actionable recommendations stemming from a complete intelligence picture and knowledge of the security apparatus at the facility could have substantially hampered the terrorist assault, possibly long enough for Algerian military units to deploy in time to prevent the facility from being overrun. Underestimated the proliferation of non-state armed groups hostile to foreign interests active in the south. Jihadist NSAG Ansar Dine at that time posed such a significant threat to the neighbouring Malian government that France launched a full-scale military campaign, Operation Serval, to prevent the country’s complete collapse. Mokhtar Belmokhtar, commander of al-Mourabitoun, had consolidated operational control over a substantial fighting force in the southern deserts, utilising his experience as a smuggler to move undetected by the local security forces. It is notable that scenario planning at Tigantourine did not consider actions-on in the event of a terrorist attack. Overestimated the ability of the state security forces to prevent militants penetrating borders. Al-Qaeda in the Islamic Maghreb (AQIM) fighters regularly crossed the north-eastern Algerian-Tunisian border, where mountainous terrain allowed militants to move with relative freedom. To the east, ongoing chaos in Libya provided ample opportunity for hostile militant actors to assemble forces near the border areas. Security mechanisms to the south, meanwhile, were not fit for purpose, and the vast, sparsely populated Sahara desert provided ample room for militants to manoeuvre. In December 2012, Belmokhtar had explicitly said he intended to strike Western targets, a threat that was not factored in to the facility’s security apparatus. Did not consider whether the Algerian military response would be tempered by consideration for civilian welfare. 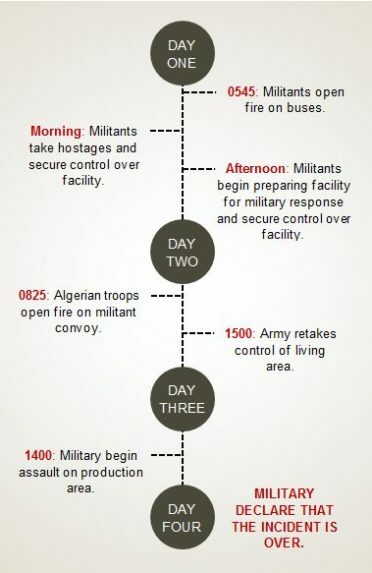 The Algerian high command’s subsequent defence of the military counter-offensive, which led to the deaths of multiple hostages, stated that the operation was conducted in line with Algerian military procedures and policies. The lack of knowledge of the army’s own security policies and force-deployment patterns led to blind-faith reliance that the military was competent to protect the facility. A critical, independent assessment would have identified that the facility was actually at substantial levels of risk, and offered actionable threat-mitigation measures. 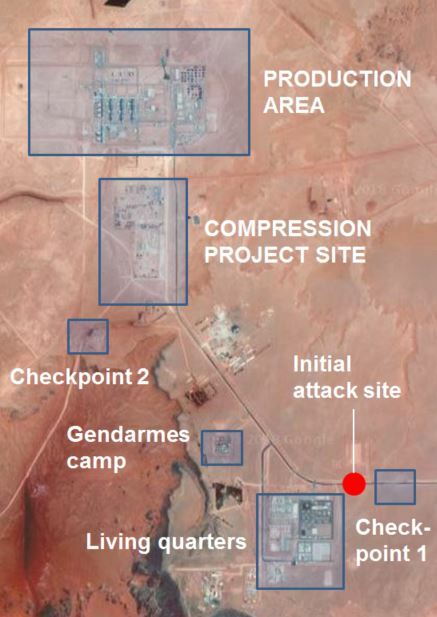 Site zone protection, within the military exclusion zone, was the primary responsibility of Algerian gendarmes, rather than private security forces. Inner security protection was undertaken by unarmed civilian guards, who lacked the training or equipment to respond to a major threat. The outer perimeter defence, which was the responsibility of the Algerian military, should have been augmented by a substantial inner cordon. Although Algerian law mandates that the military take primary responsibility over outer-security measures at critical national infrastructure, it also allows for the deployment of armed civilian guards, so long as they are local nationals. Guard forces should have been armed, trained in the responsible use of force, and communications protocols should have been in place with the Algerian military and gendarmes that secured the outer areas of the facility. Security, which had been the responsibility of Sonatrach’s internal security service, should have been managed by a cross-corporate team of dedicated experts. A more comprehensive understanding of the local, national and regional threat environment would have allowed security managers to make more informed decisions about force-levels and the extent to which the facility should have been hardened. Healix International recognises the risk political violence poses to facilities and personnel across the world, from the Algerian desert to central London. That is why our Global Security Operations Centre (GSOC) has established a counter-terrorism desk, to provide specialist intelligence and consultancy services to clients. For more information, contact us at GSOC@healix.com.